The UCAS reference sits alongside a student’s personal statement as an essential component of a UK university application. It’s the only part of the UCAS application which the student won’t have any control over. Universities cite the UCAS reference as a deciding factor which affects whether a student gains a place on their chosen course or not; it could also have an impact on whether a university offers a student a conditional or unconditional place. Much like students, teaching and guidance staff will have to prepare and write a reference within a given time frame, whilst ensuring they stay within 4,000 character limit. With the reference being such a vital component of a student’s UCAS application, there’s an understandable pressure on teachers and counsellors to get it right – especially when you have multiple students and you want to ensure that everyone gets an equal share of your time. So what are the essential components for every UCAS reference, and how can you ensure you’re portraying your students in the best possible way? Who writes the UCAS reference? It’s important to remember that the UK reference is different from the letter of recommendation sent to US universities. A UCAS reference is not written by an individual, it is designed to function as one voice from the school. Generally, subject teachers will contribute to a UCAS reference, then final edits will be done by the Head of Sixth Form, school counselor, or Head of Department. What do universities look for in a student’s reference letter? The student’s ability to write well-structured essays and create a reasoned argument. The ability to participate in class discussions. Reliability, punctuality and the ability to hit deadlines. Confidence, enthusiasm, great communication skills, leadership potential & teamwork ability. What are the essential components of a UCAS reference? A summary of your student’s post-16 academic performance, including their current and past academic achievements in their relevant classes. Why they’re suited to their chosen subject/degree course, including a description of the key skills and aptitudes they possess. Any other relevant work experience, achievements or extracurricular activities which you feel may support your students’ application. Commenting on their motivation and commitment to their curricular and extracurricular activities. Why you think they will be successful in their chosen university/career path. Where appropriate (and with the student’s consent), include any other relevant contextual information about a student which a university needs to know, or which might warrant special consideration; e.g. disability, chronic illness, adverse personal circumstances. As well as including the criteria we’ve mentioned above, there are a number of tips and strategies which can be useful as you structure and plan your reference, ensuring you use your available time efficiently and that your reference is an accurate reflection of a student’s merits and achievements. This sounds like a fairly straightforward piece of advice – however if you’re a teacher or counselor with a large group of students, setting aside quality time with every student to discuss their UCAS application might be difficult. It therefore goes without saying that, the more manageable your student numbers, the easier it will be to have a meaningful dialogue with your student about their application. Talking to your students as much as possible means your reference forms part of an application which is coherent and well-structured. It’s also important to have an honest and open dialogue with students and parents about predicted grades, ensuring that you are offering students realistic and positive advice as you guide them through their application. Tip: If you find yourself in the position of having to prioritise students for any reason, then your best course of action is to talk to the students who are applying to study your particular subject discipline at university. Obviously, your reference should be tailored to a given student’s application; the best way to ensure you understand each student’s individual aspirations and application is to read the personal statement. Reviewing and understanding what a student has to say about themselves in their personal statement is an excellent means of ensuring that your own reference complements the student’s application, without your insights and comments seeming repetitive. It can also guide and better structure what you write in your own reference. Tip: It’s also worth noting that the UCAS reference should not repeat any information given in the student’s own application, unless you are commenting on it. Like your student’s personal statement, the UCAS reference needs to make a coherent argument about why you feel a student’s aptitudes, skills and experiences mean they are suited to this particular university course. This means that you should illustrate examples to back up your reference. For example, rather than saying that a student is “proactive”, think of an example from their curricular or extracurricular activities to help illustrate your point. For every positive statement you make about a student, think about a specific example you can point to which demonstrates that particular attitude, characteristic or behavior. Jasmine has strong analytical skills and is able to operate with complex multi-step thinking. This has been evident in her work on mole calculations, where she is precise and careful, fully understanding the reason that being detail-oriented is so important. Given the time pressures we’ve already outlined, it’s important that any references aren’t rushed or written without proper planning. Likewise, if you are dealing with a high volume of student applications, it’s important to tailor each reference to the relevant student, and not rely on any particular template, or use similar language for any two students. Admissions tutors will be looking at a student’s potential in a university setting, so it’s crucial to include this in any given reference. It’s important to talk about why you think they’ll thrive in that chosen university environment, and on that particular programme of study. Eduardo works independently, tries very hard and is always eager to improve, seeking one to one feedback on his written work. I am confident that he is equipped with all the skills required to thrive in an undergraduate environment. Whilst it’s important you should offer the most positive account of your students as you possibly can, it’s also important to be honest about your students strengths and weaknesses. If a student is frequently late, cutting class, or being rude, then you’re duty bound as an educator to mention this in your reference. This can be something which is chronic and long-term, or something which has impacted the student during their studies. It’s only really useful to write about this if it won’t prevent a student from completing their degree course. Family bereavement will, of course, have a huge impact on a student, especially if they are also having to think about forthcoming exams and their higher education prospects. This can include any other ongoing issues which may be impacting an applicant’s studies, e.g. parents going through a divorce, financial issues, family mental health issues; these are all factors which could make a student’s home environment not conducive to study. This can impact a student’s application, as their parents may not be in a position to advise them or, in some cases, even encourage them in their application. These could include factors such as high turn-over of staff, unusually large class sizes or problems with timetables, which have resulted in a student having to study remotely. Finally, remember to be mindful of any and all UCAS deadlines. The UCAS deadlines for students applying to Oxford and Cambridge, as well as Medicine, Veterinary Medicine and Dentistry applications, are much earlier (in 2018 they must be submitted by the 15th October). Your reference must be submitted at the same time as the rest of the student’s application. So a UCAS reference which is truly honest, positive and supportive of your student’s aspirations can’t be left to the last minute! Looking for more tips and insights to help prepare your students for UK university application in 2019? 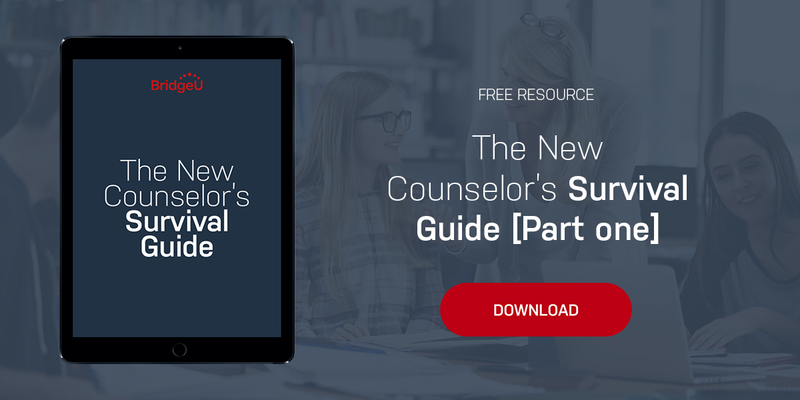 Download your free Counselor’s Survival guide and learn more about managing deadlines, getting parents invested in your university guidance program, and so much more!